A classic recipe of salad Olivier includes many ingredients, among which are crab meat, and quail eggs. Olivier salad with potatoes is a much more economical option, but no less delicious. Just need to correctly prepare all the components of the salad, and boil the potatoes. Before you cook potatoes for salad, pick up the roots of the same size. In this case, cooking will take the same amount of time. It is best to cook potatoes in the skin. In this case, the probability to digest it minimal, so in salad it will be present in the form of a smooth and neat pieces of the same shape. To do this, wash the potatoes thoroughly using a brush to get rid of the remnants of the earth. Put on the fire a pot two-thirds filled with water. When it boils, put in it a potato, cut it into pieces is not required. This method of cooking allows you to save in vegetables the highest amount of vitamin C.
When the water boils, reduce heat and cover with a lid. At this temperature, medium-sized potatoes will cook 15-20 minutes. 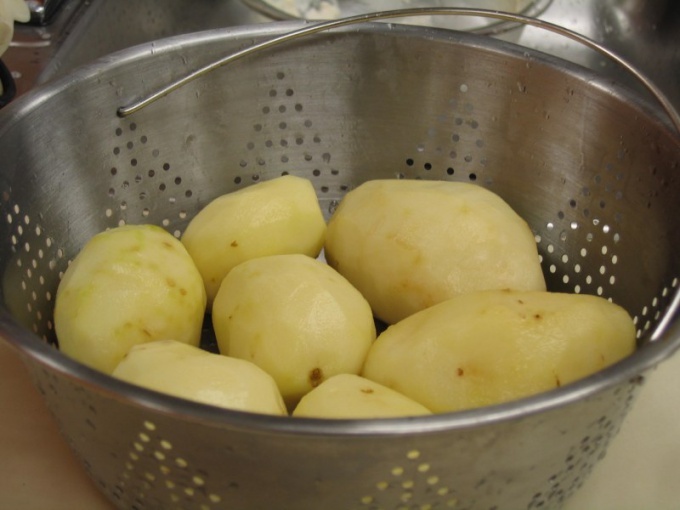 Salt water does not follow, as salt will not be able to penetrate deep into the potato using the peel. A simple test to help you determine the degree of readiness, is to pierce the potatoes with any sharp object. If the knife or toothpick into it, without effort, means it is ready. Drain the pot of water, remove the lid for a few minutes put the dishes on the fire. This will allow excess water to evaporate and the potatoes for the salad will not be overly humid. It remains only to clear the potatoes from the skin and chop. Cooking time depends on size of potatoes. To take too great for making salad is not worth it, or until it is cooked from the inside, the upper part, in contact with water will become too soft and can turn the salad into a kind of puree. Can be boiled and peeled potatoes, but in this case, you need to pay more attention to its degree of readiness to avoid digestion. When the potato is cleaned from the skin, in the water you can add a bit of salt.